Imagine this thing that has actually happened: Your infant has a strangely-shaped skin lesion. Seeing this disgusting skin lesion and thinking it might be anthrax, you take your child to the doctor. “Doc, I think I my kid has anthrax,” you might say. The doctor’s eyes roll. “It’s obviously a spider bite,” doc probably replies. Turns out your kid had anthrax all along. It’s not just anthrax—doctors have confused cases of Lyme disease and dozens of other diseases as spider bites. Specifically, they’ve blamed the brown recluse spiders that live in the southern and southern-Midwestern parts of the United States. And a few dermatologists and an entomologist want the misdiagnoses to stop. Those scientists came up with a dinky mnemonic for doctors and patients to make sure they’re not confusing something else for a recluse bite. They published it in the most recent issue of JAMA Dermatology. Brown recluse spider bites aren’t as common as you may think, according to Wired. One of the paper’s authors, entomologist Rick Vetter from the University of California, Riverside, received 1773 supposed brown recluse samples for a 2005 study, but only 324 were the real deal. Lots of other diseases masquerade as the spider’s gross necrotic bite. 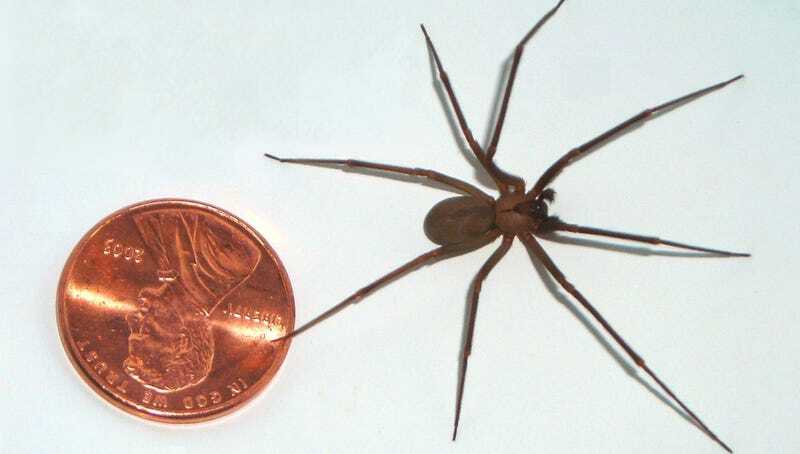 One report found only 1326 brown recluse spider bites in 2013 (which doesn’t take into account misdiagnoses), less than the number of copperhead snake bites. It is important to note that all of the authors of the new study have some sort of spider-related conflict of interest to report. One works for a company working on a brown recluse spider bite-detecting test, one has received money from the same company, and the third gets paid to talk and write about spiders. Anyway, the mnemonic is NOT RECLUSE, a list of symptoms not associated with brown recluse bites. N: Numerous lesions. Usually, brown recluse spiders only bite once. O: Occurrence. Bites usually occur when brown recluse spiders are disturbed, usually in an attic or dusty place. T: Timing. Bites usually only occur between April and October. R: Red center. Bites usually have a purple, blue-white or pale center. Not red. E: Elevated. Recluse bites are flat, not raised. C: Chronic. Bites rarely take more than three months to heal. L: Large. Bites don’t normally exceed 10 centimeters. U: Ulcerates too easily. It takes a week or two for the gross, open-skin mark to form. If it happens or if the rash crusts up too quickly, it’s probably something else. S: Swollen. Bites below the neck usually don’t swell. Bites to the face might. E: Exudative. Bites normally don’t pus up. Here’s to hoping you don’t get bit by a spider, or worse, get anthrax that your doctor confuses for a spider bite.